The smarter alternative to traditional metal braces is here and Dr. Jaclyn Scroggins is proud to offer Empower Self Ligating Brackets to patients in Kirkwood, MO. While rubber bands are typically used by orthodontists to hold braces in place, Empower Brackets use a clip to secure the arch wire in place – allowing for quick and easy wire adjustments and less visits to the orthodontist. Comfortable Design: Empower Brackets feature precise designs with contoured edges to keep the surface against your cheek and lips smooth. Less Hassle with No Ligatures: Ligatures, or rubber bands, can stain and wear out over time – causing them to need replacement more often. Self Ligating Clips: Wire adjustments are quick and virtually more comfortable with Empower’s high-quality self ligating clips. Versatile Design: No more one-size-fits-all when it comes to straightening teeth. With Empower’s cutting-edge yet versatile design and unique options available, Dr. Scroggins can customize your treatment based on your specific needs. 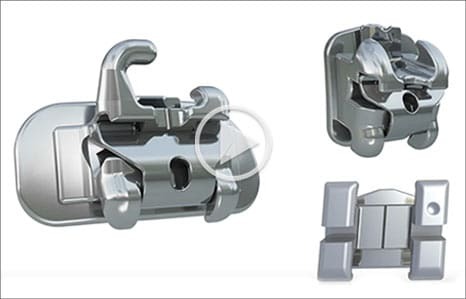 Available in clear, metal and molar options with interactive or passive designs, Empower Brackets have revolutionized the orthodontic industry to offer more than one option for straightening teeth. To learn more about Empower Brackets as a treatment option for straightening your teeth, contact our office to schedule a consultation.